Makuta, Inc.’s state-of-the-art manufacturing facility was specifically built to house our “lights out” micro injection molding manufacturing operations. We run 24/7/365 with 5 manned shifts and 16 un-manned shifts per week. Our “lights out” expertise has been written up in numerous plastics industry magazines including Plastics Technology, Plastics Machinery and Equipment, Injection Molding Magazine and Plastics Business. You can read the most recent and comprehensive article, written by Plastics Technology Executive Editor Matthew Naitove, by clicking here. Makuta, Inc. has installed two, new, highly automated cells that injection mold micro valves for a medical drug delivery device. The 2-shot parts combine a PP body (first shot) with a soft, TPE overmolded tip (second shot). Click the photo to see the video and visit our YouTube page. 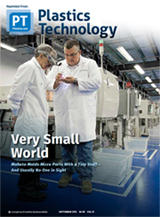 Makuta Micro Molding has been featured with a cover story in Plastics Technology Magazine. Executive Editor Matthew Naitove visited Makuta to develop the in-depth article covering the history, manufacturing technology, people and the advances the company has made in micro molding. To read the full article click here.